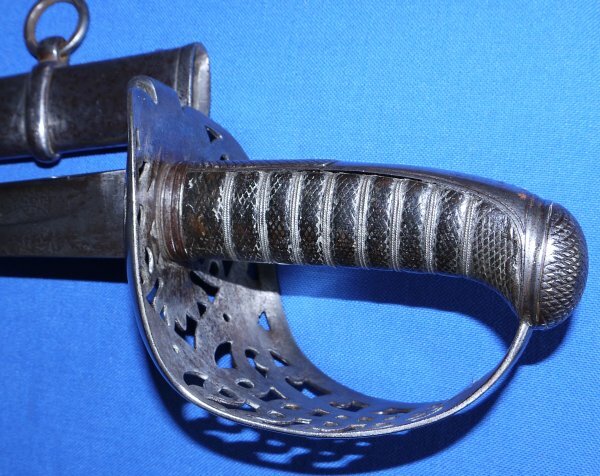 In very good condition, the 5th Dragoon Guards Wilkinson Patent Solid Hilt officer's sword of Augustus W. Travers (the "Irish Savage"), serial number 6880 for 1856. 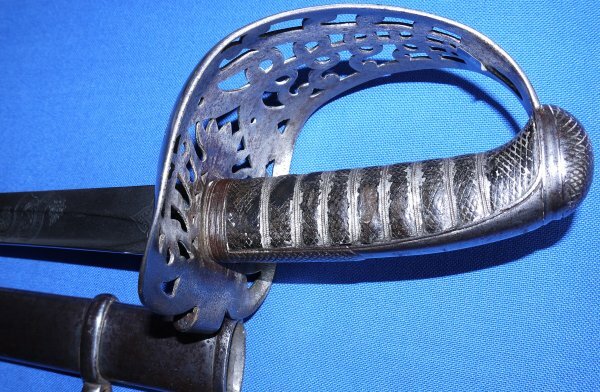 Just post Crimean War, this is the sword of then Lieutenant Augustus W. Travers who was referred to as the "Irish Savage" in the book A Cavalryman in the Crimea: The Letters of Temple Godman, 5th Dragoon Guards. 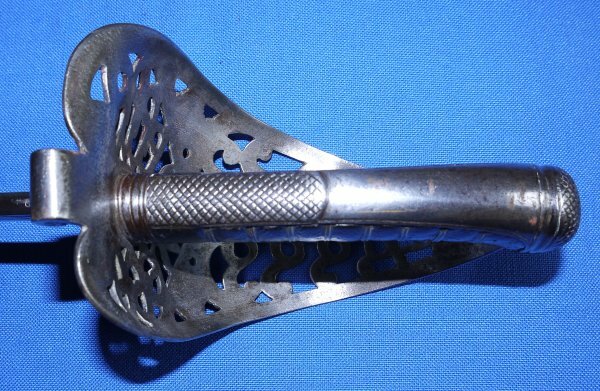 The sword itself is actually featured in the book The British Cavalry Sword From 1600 By Charles Martyn (illustration 66 / page 91). THere is little known about A. W. Travers except he made captain and was a landlord in Ireland after he left the army. He made Cornet on 20th February 1855, and was promoted to lieutenant on the 8th January 1856. 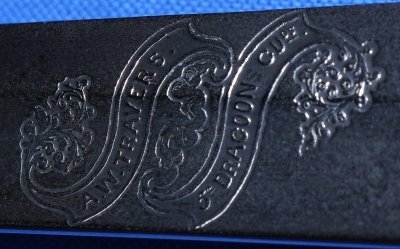 The slightly curved impressive 36 inch blade is in good condition, slightly better one side than the other, etching still clear except for the Henry Wilkinson logo etc. 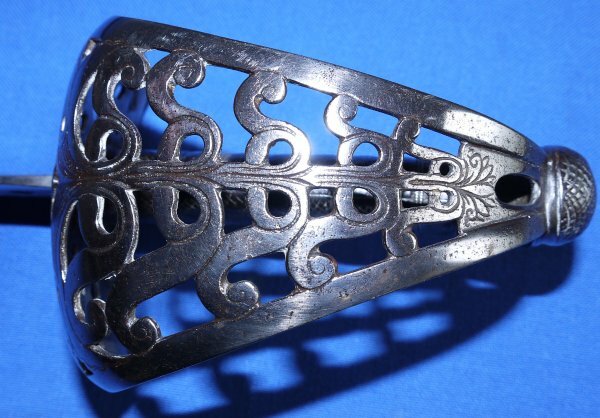 and is firm in the hilt (of course, being a Patent Solid Hilt). The hilt is generally very good. The grip in good condition, some wear, not much. The steel scabbard is good but has a small hole near the chape / drag one side. The sword sheathes and draws well but can catch. 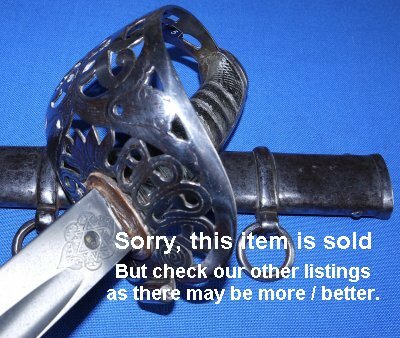 An almighty sword with plenty of provenance, yours for £? (too late, now sold). Please quote item reference number AC23 (0027). Full sized / additional photos available upon request.